This is a fabulous piece, it is a good size, 14" X 12", and weighs a substantial 25 ounces. It is large enough for six glasses. It has beautiful shell and scroll details on the handles and an elegant gadroon border with shell and scroll corners. It is raised on four bun feet. Date letter "f" for 1898. Length: 44cm handle to handle. Very good. No dents, a few minor blemishes conmensurate with age, no inscription, has never been engraved. Stable on its feet. 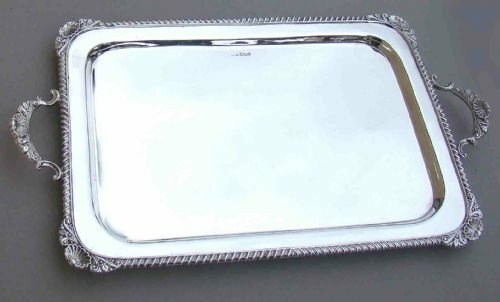 This large and impressive solid silver waiter tray or salver is hallmarked for London 1911 and was made by the renowned Thomas Bradbury & Sons. Of Georgian inspiration, it is simple and very elegant with a plain circular with shaped gadroon border. It has an excellent silver gauge, weighing over 34 ounces, just under a kilo, a testimony to its fabulous quality. Raised on three substantial scroll feet. TB for Thomas Bradbury & Sons. Date letter "q" for 1911. Diameter : 30cm / 12 inches. Minor surface scratching, commensurate with age. 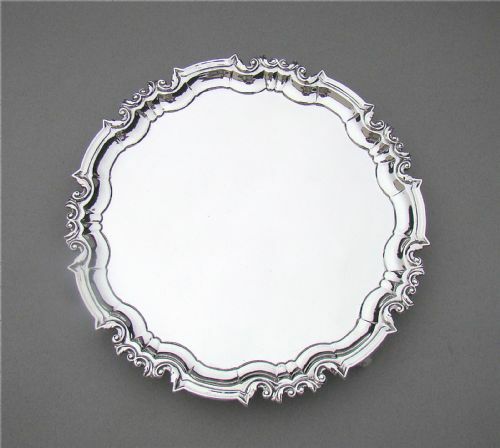 This superb 10 inches sterling silver drinks tray or salver is dated Sheffield 1902 and was made by the renowned silversmiths James Dixon & Sons. Of circular form, with a raised pie crust edge and scroll and shell border. The centre with engraved crest. Raised on three scroll feet. It has an excellent silver gauge, 21 oz, a testimony to its quality. Date letter "k" for 1902. Diameter: 25cm / 10 inches. Height: 4 cm / 1.4 inch. Very good. No dings, no dents. Minor surface wear , commensurate with age. 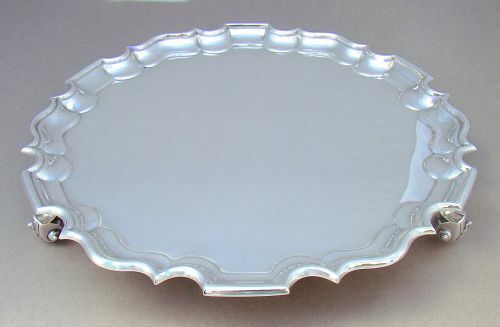 A fabulous salver in pristine condition. This fabulous 8 inches silver salver is hallmarked for London1910 and was made by the celebrated silversmiths William Hutton & Sons. It is simple and very elegant with a raised shaped border and three scroll feet. It has good silver gauge, 10.5 oz, a testimony to its quality. Diameter: 20cm / 8 inches. Very good. No dings, no dents, no inscription, has never been engraved. This superb 8 inches silver salver is dated Shefiield 1926 and was made by the renowned silversmiths Hawksworth, Eyre & Co Ltd. It is simple and very elegant with a raised shaped beaded border and three pad feet. It has an excellent silver gauge, 12 oz, a testimony to its quality. Date letter "i" for 1926. This delightful and elegant spot-hammered Arts & Craft silver oval letter or card tray was made by the Arts & Craft maker George Lawrence Connell* and is dated Birmingham 1928. The lightly hammered surface with a raised rim and stylised fleur-de-lys decorations. *G.L. Connell is credited with introducing "modern, artistic silverware" to the firm's wares from the late 1890s. 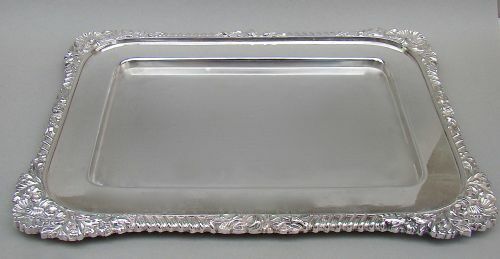 His wife Christine was a silversmith, whose work bearing the GLC maker's mark was sold by the firm, and who may well have had a hand in the design of this tray. GLC for George Lawrence Connell. Date letter "C" for 1928. 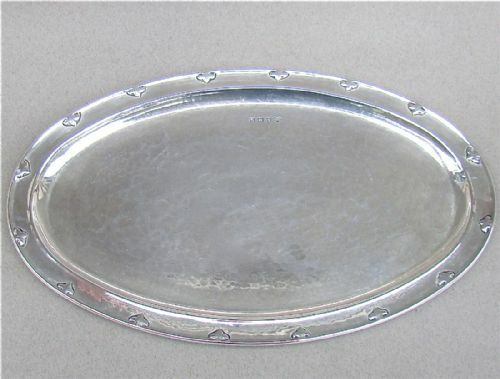 This is an unusual silver plated drinks tray made circa 1930. Of rounded rectangular form, it is a good size; 15" X 11" . It is large enough for eight small wine glasses or ten champagne flutes. It has very distinctive and decorative handles and an elegant tongue and dart border. Width: 29 cm / 11.2 inches. Very good. No dents, a few minor blemishes conmensurate with age. A superb and very elegant tray. This exquisite Edwardian silver plated drinks tray was made by the renowned Hukin & Heath and dates circa 1900 . 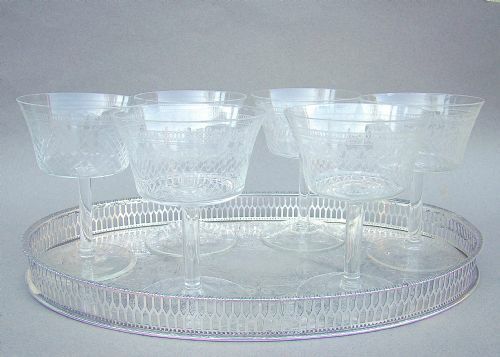 It is large enough for or six to eight wine glasses or champagne flutes, depending on the size of the glasses. It has a beautiful raised border interspersed with flowerheads and scrolls. The reeded side handles with acanthus leaves decorations. Electroplated marks of Hukin & Heath. Width: 27cm / 11 inches. Length: 29cm / 11.4 inches. Width: 21cm / 8.3 inches. No base metal showing through. Minor surface wear commensurate with age. No oversea postage as too heavy and costly to post. 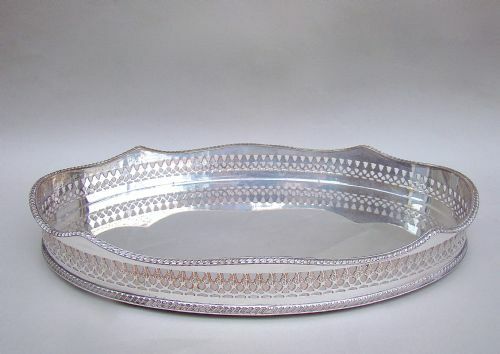 This stylish Edwardian silver plated galleried drinks tray is large enough for six champagne or medium sized wine glasses, depending on size of glasses. It has an elegand pierced galleried border. Width: 20cm / 8 inches. No inscription, has never been engraved. Postage UK: £8.00 Recorded delivery. 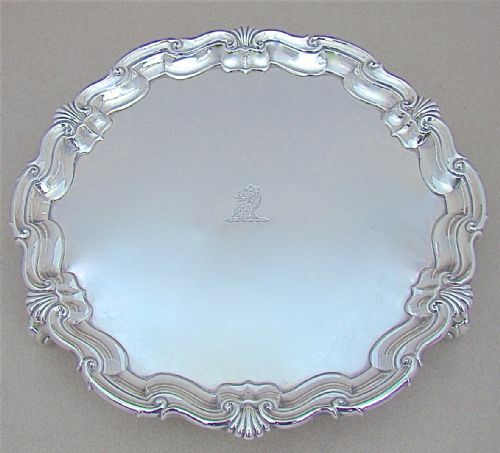 This is an unusual and very attractive George III Old Sheffield plate salver. From the solid centre emanates a wirework border embellished with applied decoration of vine leaves, grapes and flower garlands. The garland decorations have been stamped and chased and then soldered onto the wires. Raised on three very decorative cast and pierced bracket feet. 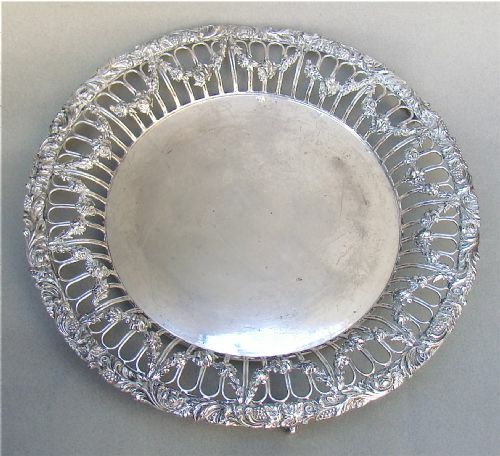 This type of ornament shows that this salver would originally have been used for fruit or bread. silver plating slightly dull at places. No signs of repairs the the feet. Diameter: 24cm / 9.4 inches. Height: 3cm / 1 inch. Postage UK: £10 First class recorded. Postage overseas: £20.00 standard parcel. 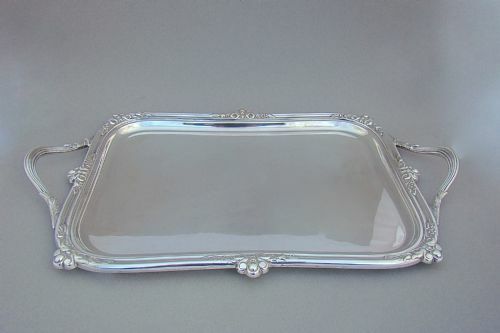 This is a very elegant Victorian silver plated drinks tray. It is large enough for six champagne flutes or three to four wine glasses, depending on size of glasses. It has a beautiful gadroon border with shell, flower heads and scroll corners. Width: 22cm / 8.4 inches. Length: 22cm / 8.4 inches. Very good. No dents, a few minor blemishes commensurate with age. 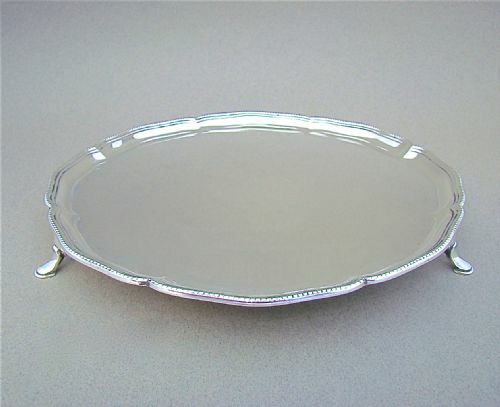 This stylish Edwardian silver plated galleried drinks tray is of oval form. It is profusely engraved with scroll patterns surrounding a vacant reserve. It has an elegant pierced galleried border. It is large enough for six champagne or medium sized wine glasses, depending on size of glasses. .